Time flies when you’re…well–actually, time seems to fly regardless. And there goes July… Wait, What!? Seafair Fleet Week and Boeing Maritime Celebration: Tour the US Navy USS Momsen and USS Somerset at Pier 90, and the Royal Canadian Navy HMCS Yellowknife and HMCS Whitehorse at Pier 69, for free from 9 AM to 3 PM. Expect traffic congestion along the Waterfront. Seattle Mariners vs Houston Astros: #TrueToTheBlue wrap up this 3-game series at Safeco Field; 7:10 PM – 10 PM. Estimated attendance: 36,000. Construction: WSDOT will close 3 right lanes of NB I-5 for repair work, 9 PM – 5 AM, from Denny Way to SR 520. Seattle Art Fair: Enjoy preview day at CenturyLink Field Event Center with 2,000 attendees expected during the 3:30 PM – 6 PM and 6 PM – 9 PM sessions. Blue Angels & I-90: The I-90 floating bridge will close 9:45 AM – 12:15 PM and 1 PM – 2:45 PM for Blue Angels practice flights. Seattle Mariners vs. Toronto Blue Jays: The Mariners kick off a 4-game series at Safeco Field, 7:10 PM – 10 PM. Estimated attendance: 30,000. Seafair Weekend Festival: Festivities in Genesee Park and along Lake Washington Blvd run from 8 AM to 6 PM. Attendance is estimated at 50,000, so try alternatives to driving. Umoja Fest Africatown Heritage Festival Rally: This celebration of African American community in the northwest features music, food, culture, and family fun! Hours are 10 AM to 8 PM Friday, at Judkins Park. About 4,500 attendees expected over the weekend. Seattle Art Fair: At CenturyLink Field Event Center. Fair hours are 11 AM to 8 PM. Estimated attendance: 2,000. Blue Angels & I-90: The I-90 floating bridge will close 12:55 PM – 2:45 PM, for the first Boeing Seafair Air Show of the weekend! Seafair Fleet Week and Boeing Maritime Celebration: Tour the US Navy USS Momsen and USS Somerset at Pier 90 from 2 PM to 7 PM, and the Royal Canadian Navy HMCS Yellowknife and HMCS Whitehorse at Pier 69, from 9 AM to 3 PM. Magnolia Summerfest: This 2-day festival features an art show, craft booths, and activities at the Magnolia Community Center and Magnolia Playfield at 33rd Ave W & W Smith St. Hours are 3 PM to 11 PM Friday. Estimated attendance: 2,000. Seattle Mariners vs. Toronto Blue Jays: The Mariners are home for game 2 in this 4-game series, 7:10 PM – 10 PM. Estimated attendance is 38,000. Blue Angels & I-90: The I-90 floating bridge will close 12:55 PM – 2:45 PM for day 2 of the Boeing Seafair Air Show! Seafair Weekend Festival: Festivities in Genesee Park and along Lake Washington Blvd run from 8 AM to 9:30 PM Saturday. Attendance is estimated at 50,000, so try alternatives to driving. Seafair Fleet Week and Boeing Maritime Celebration: Tour the US Navy USS Momsen and USS Somerset at Pier 90, and the Royal Canadian Navy HMCS Yellowknife and HMCS Whitehorse at Pier 69, for free from 9 AM to 12 PM. Expect traffic congestion along the Waterfront. Museum of Flight Jet Blast Bash: Enjoy the air show from this annual 2-day family festival, with fast planes, fast cars, music, food and fun on the Blue Angels flightline, 10 AM to 4 PM. Lake City Summer Festival: Annual summer festival on NE 125th St. between Lake City Way NE and 25th Ave. NE. Festival hours are 10:30 AM to 4:30 PM. Estimated attendance: 5,400. Seattle Art Fair: At CenturyLink Field Event Center. Fair hours are 11 AM to 7 PM Saturday. Estimated attendance: 2,000. Umoja Fest Africatown Heritage Festival Rally: Annual festivities celebrate African American community in the northwest with bands, fashion shows, sports competitions, and more! Hours are 12 PM to 8 PM Saturday, at Judkins Park. Umoja Fest Africatown Heritage Parade March: Saturday’s parade starts at 1 PM, at 23rd Ave and E Union St. The route heads SB on 23rd; W on S Jackson St; and SB on 20th Pl S into the Festival at Judkins Park. Estimated attendees: 1,075. Magnolia Summerfest: This festival at the Magnolia Community Center and W. Smith St. Festival hours are 3 PM to 11 PM Friday. Estimated attendance: 2,000. Lake City Summer Festival Parade: Annual parade on Lake City Way NE between NE 135th and NE 125th streets. This year the parade will turn on NE 125th St, and head west to 26th Ave NE. Kid’s Parade: 6 PM; Dog Parade: 6:30 PM; Grand Parade: 7 PM. Estimated attendance: 5,400. Greatest Party Known to Humankind: An estimated 4,000 people celebrate biking in the streets of Georgetown, 6 PM Saturday until 2 AM Sunday. Note: Airport Way, from Corson Ave S to 13th Ave S, will close to vehicle traffic: 12 PM Saturday – 3 AM Sunday. Seattle Mariners vs. Toronto Blue Jays: The Ms are at Safeco Field again, for game 3 in this 4-game series, 7:10 PM – 10 PM. Estimated attendance: 45,000. Seattle Mariners vs. Toronto Blue Jays: Our Mariners wrap up this 4-game series with an afternoon at Safeco Field, 1:10 PM – 4 PM, followed by a Run Around the Bases for fans age 14 and younger! Heads up: 44,000 people expected. Seafair Weekend Festival: Festivities in Genesee Park and along Lake Washington Blvd run from 7:30 AM to 6 PM Sunday. Attendance is estimated at 75,000, so try alternatives to driving. Umoja Fest Africatown Heritage Festival Rally: Annual festivities celebrate African American community in northwest featuring Music, Food, and family fun! The festival runs from 12 PM to 7 PM Sunday, at Judkins Park. Blue Angels & I-90: The I-90 floating bridge will close 12:55 PM – 2:45 PM, for the last day of the Boeing Seafair Air Show! Seattle Art Fair: At CenturyLink Field Event Center. Fair hours are 11 AM to 6 PM Sunday. Estimated attendance: 2,000. August 6 – 8: NB I-5 from the Ship Canal Bridge to NE Ravenna Blvd, 3 right lanes closed overnights from 9 PM to 5 AM. August 6 – 8: NB I-5 from Denny Way to SR 520, 3 right lanes closed overnights from 9 PM to 5 AM. August 6 – 9: WB I-90 from Island Crest Way to Rainier Ave S will be fully closed from 10:30 PM to 4:30 AM. August 8: Pearl Jam concert at Safeco Field, 7:30PM. UPDATE | August 9: Seattle Seahawks vs. Indianapolis Colts pre-season game at CenturyLink Field, 7 PM. 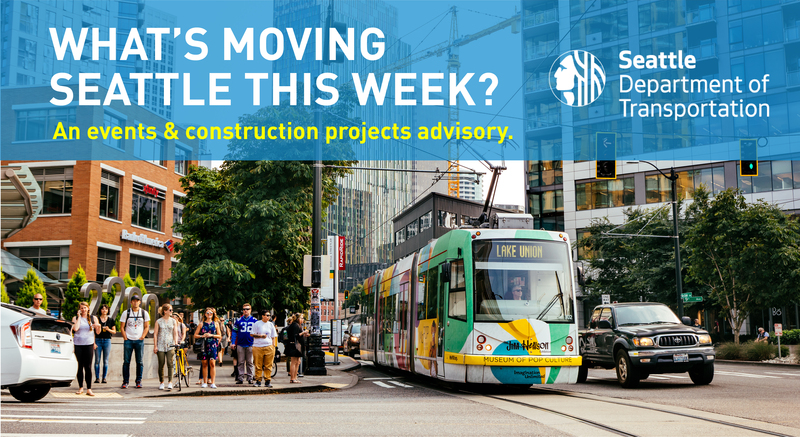 Email us at construction.coordination@seattle.gov or call 206-684-ROAD (7623).